Biometric based system plays a crucial role in the global industrial ecosystem and is regarded as a significant technology in the present scenario. Biometrics has helped to deliver secure services in various circumstances and is considered to be a deterrent to people with malevolent intentions. It has helped to identify known suspects traversing crowded security areas, such as airports, railway stations, and other locations. With the development and implementation of advanced innovative technologies and concepts such as biometrics in field of anti-terrorism protection, terrorist attacks have been somewhat reduced. 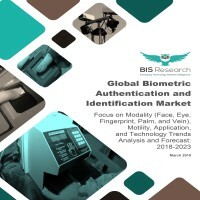 The biometric authentication and identification market has been tracked along the lines of modality (facial, fingerprint, eye, vein, palmprint, voice, and handwritten), motility, application, and regions. Revenue generated from various application segments, namely, banking and financial institutions, government, enterprise, healthcare, commercial, and others, have been analyzed. The report also covers the biometric authentication and identification technology market on a global scale and consequently provides revenue data of the key regions. A separate segment specifically has been dedicated to the key global regions: North America, Europe, Asia-Pacific (APAC), and Rest-of-the-World (RoW). The use of biometric systems widely finds its application in areas such as high security forensic laboratories, banking and financial institutions, and other similar areas. Based on the end-user requirements, different modalities are preferred for user identification, such as recognition based on facial, fingerprint, eye, and palmprint, among others. The fingerprint authentication and identification modality is widely used due to its high flexibility and reliability. Moreover, government institutions (law enforcement, border security, ID issuance, and homeland security), healthcare, enterprises, banking and financial institutions, commercial, and other sectors have adopted this user authentication technique to ensure an overall protection to the population from any impeding global crisis. The current drive towards cashless economy has compelled people to switch to digital banking or electronic transfers. Also, a gradual rise in cashless transactions has led to an increase in digital threats and fraud in the last few years. On the basis of application, the global biometric authentication and identification technology market is segmented into banking and financial institutions, government, enterprise, commercial, healthcare, and otherss. Government segment is the highest revenue generating segment among all the applications of biometric authentication and identification; whereas enterprise is expected to grow at the highest rate during the forecast period. In the government application segment, biometrics are primarily used in the law enforcement agencies, governmental organizations, and defense establishments. Integrating biometrics in the existing access control and authentication systems holds the potential to largely increase the reliability of existing solutions. The market study by BIS Research has identified North America as the leading region in the global biometric authentication and identification market accounting for almost 31.02% of the net revenue generated by the biometric authentication and identification. APAC is also anticipated to be a promising market with a multi-fold rise in demand expected from China, South Korea, Japan, and other Asian nations in the coming future.